Monday, August 26, 2013 at 5:10 pm. It’s still — very much — the ‘real iPad’. The major difference between the iPad mini and my original iPad, purchased in 2010: I’m still actually using this one every day, almost a year after I bought it. That wasn’t the case for my big, bulky first-gen iPad. As I wrote in a February, 2011 re-review, also after 300 days: “The main thing you need to know about my iPad right now is that I’m not sure where it is.” Ouch. The main thing you need to know about my iPad mini right now is that it’s here next to me, and I’ve already been using it a bunch today. I also fell asleep reading it last night, and almost every night last week. The iPad mini’s light weight and easy holding have kept it as my go-to for reading anything longer than a few tweets. On a recent vacation to Brazil, I read two books and a magazine on it, watched a movie and a few TV shows, brought a bunch of “photocopied” pictures of a hardcover restaurant guide, etc. It’s the second-best travel companion Apple has made, after the iPhone. I still don’t use it on the subway. I guess by now I should just give up on the idea of using an iPad on the train. A lot of people do it, but I still prefer my phone. I don’t miss the extra screen size of a big iPad, and probably won’t buy another one. I would be tempted by an even-smaller iPhone-iPad hybrid. It’s unlikely an iPad will replace my laptop for work stuff any time soon — I still use way too many apps at a time, most of which aren’t properly available for iOS — so I’ll keep my tablet small, even if there’s a bigger iPad on the market with “mini”-like thinness and weight characteristics. (I sold my “new iPad” with retina screen on Gazelle, and saved up for an espresso machine, which I love.) We’ll have to see what happens if Apple ever does a 5- or 6-inch gadget — a really-big iPhone might be enough to justify consolidating to one device. My pal David Ewalt swears by his Galaxy Note, and I’d probably enjoy this sort of iOS beast. I will almost definitely upgrade to a retina iPad mini, this time going for more storage (32 GB?) and a built-in LTE modem for on-the-road Internet access. I know, I can tether this thing to my iPhone for no extra fee, whereas I’d have to pay extra to add an iPad to my shared-data plan. But there’s something scary and irresponsible about draining two batteries at a time that has prevented me from tethering much so far. As a result, I almost only use my iPad at home. So: Buy an iPad mini now or wait for an update? Unless there’s a specific reason you really need one today, I’d wait a couple months. My guess is that by early November or sooner, there will at least be a faster iPad mini on the market. That will be nice for iOS 7. Wish list: Speed, more memory, a real Instagram for iPad (kind of nuts this hasn’t happened yet), retina screen, stronger magnets in the Apple smart cover and/or a better-than-Microsoft’s Surface keyboard cover, split-screen Twitter/Safari app, easier wireless file transfers from Mac. 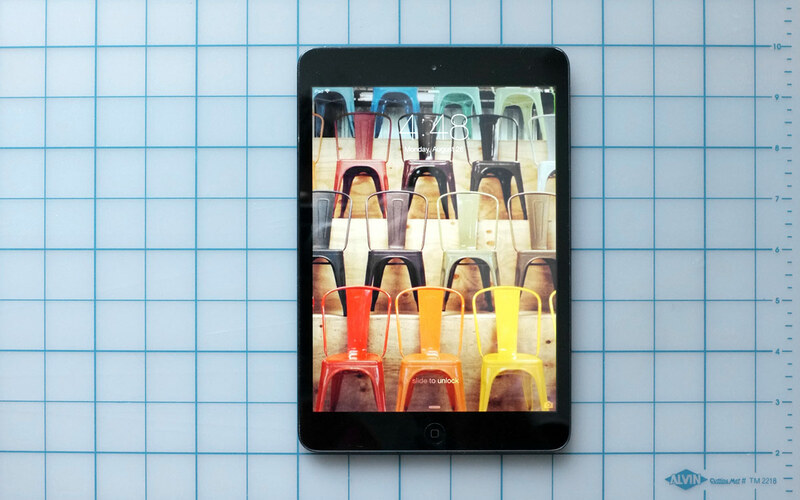 Note: By popular request, you can now purchase a full-resolution version of my iPad’s lock screen photo for $5 via Gumroad.